This morning I came across this posting (below) on Facebook. Cindy and I were BFF’s before BFF’s ever meant anything. I remember moving to Quincy, Michigan, High School, my sophomore year. Dreaded it, hated the thought of it, stood in the doorway of my bedroom and wouldn’t let the guys helping Dad move to Quincy in to move my stuff out. There were only 3 freshman girls that year that made the varsity girls basketball team. I was one! I didn’t want to move because Quincy was phasing out girls basketball. I remember when Cindy’s parents brought her and her sister Cathy to enroll in school. We sort of were the new girls! Trust me when you move at that age, the girls don’t like you because you’re competition! But the boys sure like you! The above picture is of our gymnasium. At the time it was the most beautiful gym in the area. Quincy had just built a new school. Spent many hours in that gym, cheerleading practice, cheering at games, and of course the dreaded Physical Education class. I was such a dedicated cheerleader! My youngest sister, Kelly, had the measles. Of course I caught them! But there was a game that night and I wanted to cheer. Remember, this was the time when cheerleaders wore heavy, bulky sweaters and skirts, altho’, we wore culottes. I knew by the time the bus got to Jonesville, I had a fever. Kept going into the bathroom to check for measle spots! Oh boy, did I ever have them! I figured I could get away with a red face, thank heavens the bulky sweater covered up my arms and stomach. When I got home from the ball game, I remember running into the living room, and yelled, “I have the measles!” Lifted up my shirt and both parents at the same time said “yep, you do” – I was so mad at Kelly! She’s almost 12 years younger than I am….so as she got the measles, the mumps, etc., I got them too. I remember one year missing semester exams because of measles, and the second semester exams because of mumps! Three day measles were so easy to catch…..I had them a lot. This is before the vaccinations. But when I was pregnant with Amy, the Dr. came in and said your blood work shows you don’t need to worry about measles. Told him I had them many times! When I saw Cindy’s post, it sure brought back memories. We double dated a lot. I remember one time Mark and her husband, Brad (our boyfriends at the time), took us to the Marshall County fair. They wouldn’t ride any rides but Cindy and I sure did! Yep, we both married high school sweethearts! And we are both still married to the same person! We both had our first girls fairly close together too. I remember a picture taken of Amy and Holly sitting on Mark’s parent’s couch…..so many, many years ago!!! How can we be this old! It seems like just a few years ago! Thanks for bringing back the wonderful memories! Since my daughter was so kind to sign me up for this alumni group, I’ve been flipping through “old news”. 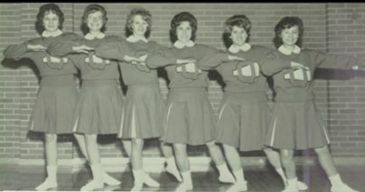 I came to QHS from CHS my Junior year, 1963-’64. I was not happy when my parents moved our family from Coldwater where my friends were, to what I considered “no man’s land”, a farm on Southern Rd. I was promised that if I gave it a chance for three weeks,and still thought my life had ended, they would pay the tuition (required back then) and I could return to and graduate from CHS. I remember vividly, Mom taking me to QHS to register. I will admit, my impression of the physical building was one of awe. It was “new” and beautiful. It still is beautiful! The first person we came across was, then custodian, Howard McConnell. For those of you who were lucky enough to know Howard, you will understand when I say he was a great guy, friendly, welcoming and kind. Who knows if by some intuition, the look of dread on my face or he’d “been there, done that before”, he recognized I was not happy, was on the verge of tears, and before directing us to the office, he said, “I have someone I want you to meet”. Howard introduced me to a young lady who had been in my shoes the year before. Her name was Nancy Reynolds, the daughter of then Principal Ron Reynolds. Needless to say, I got enrolled for classes, started school and when my parents asked me, after the first day if I wanted to return to CHS, my answer was “no”! I fell in love with my new friends, Nancy and I were BFF’s, although that expression did not exist then, but she’s the kind of friend that, though the miles have separated us most of our married lives, we could pick up where we left off, today! I met my husband at QHS. It was, and is, a great school, in a great community! …..and, men of old, as Giants, facing reliance, shouting defiance! Quincy! Rah! Rah!…. Last Wednesday, the girls and I went Christmas shopping at City Mall in Alajuela. Jean Marie was going with Ana and Joana. Joana is in 6th grade, Nazareth is going into 5th grade. They hit it off right away. I followed Jean Marie and she drove right on past the entrance of the mall that I usually use. Oops, #1. I tried calling her and she tried calling me; finally after 3-4 calls we reached each other. We were heading into Forever 21 and we met up with them there! Poor Jean Marie! Was shocked to see how much Nazareth had grown! The girls looked around there and then decided they wanted to go to Aliss. So on the way to Aliss, we found a store where everything was 50% off and Dylana thought we should stop there. (She shops like I do!) She found a couple of things there she wanted so that was a succesful stop. Then off to Aliss. I feel badly for Nazareth, because she’s 11 years old going on 25! At one point I told Maricela to get Nazareth out of the maternity department! She had no clue that’s where she was! Then Jean Marie and her crew showed up. Joana saw some jeans she liked. I am almost 70 years old and saw something I’ve never seen before! Joana put the waist of the jeans around her neck and declared they were too small. Aparently, if you do that you know that they’ll fit! So of course, when I got home I tried it. Mine were not tight because I could get a couple of fingers between the ends of the waistband. Will wonders never cease! Then to lunch at the food court. Jean Marie asked me how I handled it and I said I give them each 5 mil ($10) and they go get what they want and bring me the change! Of course the three girls and Maricella went to Pizza Hut! LOL While they were eating, Joana was looking at the receipt and said that if you go on the internet, you might win a free pizza! So while they were eating, and doing that, lo and behold, all three girls won personal pan pizzas! Lots of excitement!!!! Jean Marie and her crew left after lunch. My crew and I stayed. Wanted to take them to Cemaco because they had the most beautiful Christmas villages set up. I’ll be darned if they hadn’t already taken them down. It was Dec. 8th! Things are different in Costa Rica, rather than mark down Christmas decor and get rid of it, they store it and bring it out next year. For a shopper like me that was a disappointment! Meanwhile, we’re looking for a bathing suit for Nazareth, who is very developed! She saw a swim dress that she liked and her mother wouldn’t let her try it on telling her it was for older people. Finally, found a suit at Rosebal. And I even found a king spread for the bed for 20 mil. Then we were headed to PriceSmart. Just needed a few things and $150 later, we left there. And there was nothing really to eat in the purchase. Asked the girls if they wanted ice cream before heading home. So we went to the shop next to the Farmacia there and they all came out with the same thing. Almost like a granazado! Got home at 4:30 p.m. – left at 9 a.m., whew, I was beat. Everyone was beat because there wasn’t much talking coming home! All in all it was a fun filled day and they do enjoy seeing the decor in the mall. But they know the rules, when they open their gifts, they have to ooh and aah with delight! We have Christmas on Christmas Eve morning with Maricela and her family (mother, sister, nephews, etc.) They’ve been talking about it since the beginning of November. Last year I was shocked because the kids wanted to eat first, then open presents! Don’t know many kids that would want to do that! So Merry Christmas to all……….while you are shoveling snow, think of us having brunch poolside!